We are halfway through January and I’ve finished my first Read Harder Challenge book! I decided to start with prompt #1, otherwise I would do all my favorite prompts first and leave my least favorite until December…which would make for a not-so-fun end of the year. The challenge’s first prompt is to read an epistolary novel or collection of letters. 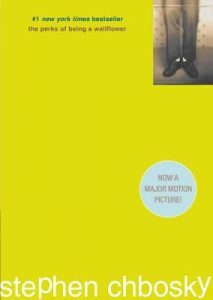 I chose to read The Perks of Being a Wallflower by Stephen Chbosky. I started this book with the notion that I was way overdue to read it. It seems to be one of those cult classics that you hear about over and over again throughout your life. I don’t know why I haven’t picked up this book until now, but I figured the Read Harder Challenge was a good excuse to finally do it. What I’m about to say might be extremely unpopular but, I was pretty disappointed with this read. Maybe all the hype built it up to such a level that it would never meet my expectations. Maybe it’s just not my type of book. Who knows? This book made me consider what it means to be a wallflower and, on the other hand, what it means to actively participate in your own life. Charlie, the main character, is a wallflower in the truest sense. Does this serve him well? Maybe in some cases, yes. But by and large the message of the book is that you need to put yourself out there to get the most out of life. It also led me to reflect on what high school life is like. The Perks of Being a Wallflower came out in 1999. In it, kids are smoking at school, making mixed tapes, and calling each other from landlines. In these ways, a lot has changed for high schoolers. However, many of the same experiences portrayed in the book are still common for teens today. Going to parties, developing crushes, struggling in school, tensions at home, and finding one’s place are certainly things we can all relate to. Charlie’s voice was unbelievable. While reading it, I constantly questioned if this was how a real 15 year boy would sound. He seemed immature and simple. In the end, we find out why he may be psychologically different. However, I still felt like I couldn’t invest in him, because I couldn’t believe him. Parts of the plot were unbelievable. Charlie’s relationship with Samantha often had me shaking my head. It just seemed weird. Also the ending seemed so anti-climactic given the subject. I don’t want to spoil the end for those of you who haven’t read this yet, but really?! As I said earlier, I realize my opinion of this book is not the popular one. I’d love to hear your thoughts. Debate me, please! Maybe you can help me see why this book is so big.